Hi parents, my name is Perrin. 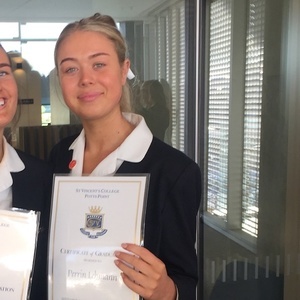 I am 18 and have just recently finished year 12 at st Vincent’s college and completed my certificate 3 in health services. I have had loads of experience with kids from ages 5m-14yrs old. This is through both baby sitting as well as nannying! Having younger siblings and being an Aunty I am very familiar with children. Through experience I have done lots of school pick ups and drop offs, homework, sport/ activity’s, cooking/cleaning and bathing and bedtime. I believe I am very patient, nurturing, responsible, confident and great at relationship building. I’m very flexible and happy to help out! Look forward to hearing from you. I started baby sitting when i was 13 and have looked after children from ages 5m-14yrs old. I am very responsible, caring and interactive and make sure any child is well cared for. I am flexible and reliable and will work around your needs. I have a lot of experience with children and baby sitting as I do a lot of baby sitting at home with 3 children ages between ages 2 and 8. I also help a lot of neighbours and family friends. What I enjoy most about baby sitting is meeting new children and families, caring and educating them and also working hard and being dedicated. "Perrin was great with my little bub, we can’t wait to have her back :)"